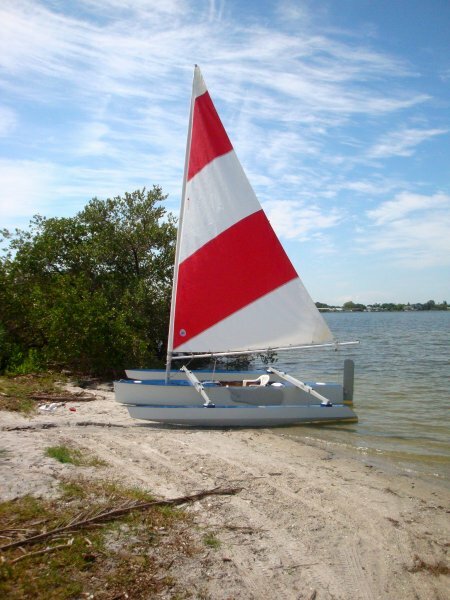 Over the years, many of the folks who have visited my web site (www.DIY-Tris.com) have requested building plans and most of those requests have been for “Laura’s Boat” - a 16′ trimaran that I originally built for my wife (who wanted one of her own after sailing my own 16 foot tri). As it turned out, Laura’s Boat outperformed my own tri in just about every way. And the “Slingshot 16” trimaran offered here is a significantly improved version of the original Laura’s Boat. Slingshot 16 has 2″ more freeboard, a fuller bow, amas that are two feet longer, and a stronger hull in the area of mast / sail support. The Slingshot 16 will hit 14 mph, points higher than 45 degrees, and turns on a dime. 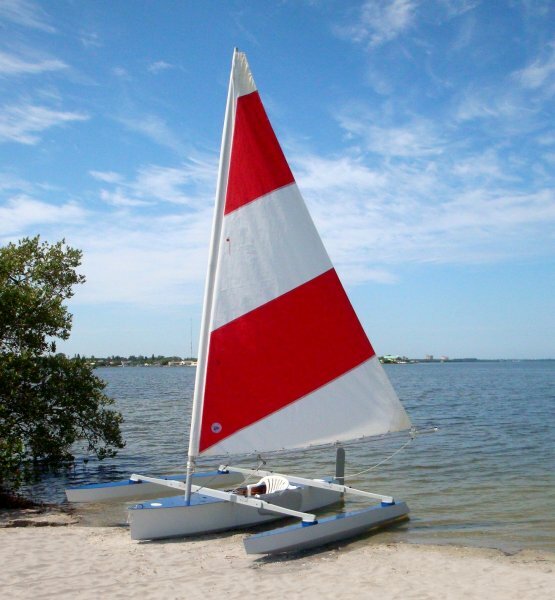 It can be launched in 4″ of water and sailed away - upwind - in just 6″. I have had as much as 128 sq. ft. of sail on it, which is quite a bit for an unstayed mast (i.e., no shrouds), but I think 110 sq ft of sail is probably the ideal ‘maximum’ for general day-sailing. The improvements made to the Slingshot 16 over the original Laura’s Boat add about 10 lbs, but also make for a much sturdier and more seaworthy boat. The 3″ overhang around the edges of the foredeck make an already-dry boat even drier to sail, and the longer amas enhance both speed and smoothness of ride. Although I have 4 trimarans ready to sail (two 16-footers, and 19-footer, and a 24-footer), it’s the Slingshot 16 that I always seem to grab when the urge to sail hits me. Although all these little tris are quick, nimble, dry, stable, and a blast to sail, Slingshot 16 just seems to put it all together in the most irresistible way. NOTE: Both the original Laura’s Boat and Slingshot 16 were built from plywood (3mm and 6mm) costing under $15 a sheet. Or, you can spend the extra $ for okoume or some other pricey species of plywood. As long as the glue is waterproof, you can use any ply you wish. Main Hull (if built entirely from 6mm ply): 2 sheets. If bottom, bilge, and sides built from 3, 4, or 5mm ply): 3 sheets (+ 1 sheet of 6mm ply). Amas (outriggers): 2 sheets of 3mm or 4mm ply. An extremely detailed construction manual including more than 280 photos detailing the complete building process, with over 70,000 words of explanatory text by Frank Smoot. A separate manual with 67 superbly detailed, multicolor CAD drawings by Andrew Walters.